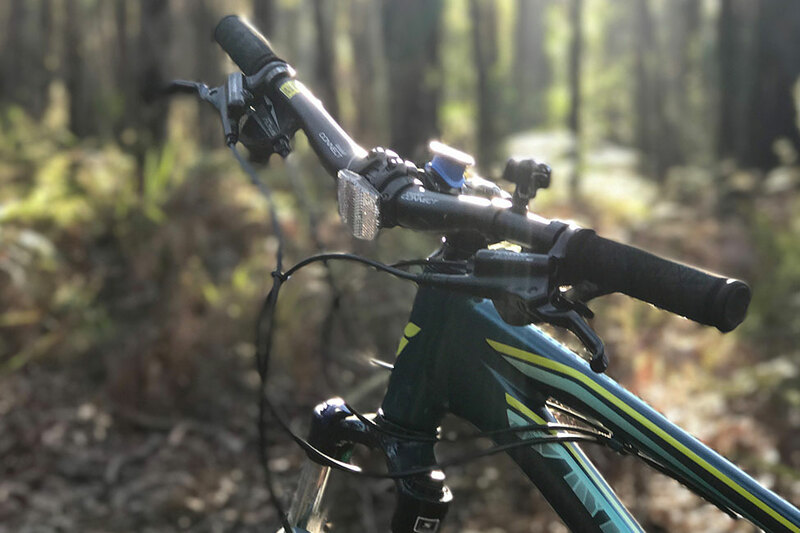 For me, a bestselling crime writer based on the stunning Sapphire Coast, where you’ll find some of the best mountain bike tracks in the world, they are intrinsically linked. As part of the launch of my fifth crime novel FOUND, I shared with Sapphire Coast Tourism how the bike trails I ride inspire my writing. I also shared some excerpts from my new book, which the Australian Federal Police launched in Canberra on July 27, 2017. The morning is warmer than usual and it won’t be long before I won’t need my gloves or beanie beneath my bike helmet. I look to my right and admire the swans gliding gracefully on Wallagoot Lake. The water is so still it looks like glass. To my left I hear a rustle in the thick bush and wonder if it’s the lyre birds I see from time to time, building their nest, or something more sinister. I shift gears as I reach a slight incline and look down at my handlebars. Something flashes past my face and my heart skips several beats as wildly look around to see what it is. It appears again, then multiplies. Butterflies. One, five, ten, twenty. They dance around my head then disappear into the bush. A few moments later they return, then they’re gone again. They follow me like this as I ride past the boat ramp, along the corrugated dirt road and to the entrance to Bournda National Park. I stop for a drink and admire their quiet presence, wondering if I will be quick enough to capture them on my camera. I’m not. I keep riding. There’s a steep section and I’m so distracted that I forget to change gears and nearly don’t make it up. The butterflies are still with me when I reach Wine Glass Bay, and they follow me to the steps leading down to Turingal Head beach. My thoughts flutter to the fifth book I’m writing and by the time I’m back home, I have a new chapter already written in my head. Ant was ahead of her, gesturing and pointing out things while Andy quizzed him. Occasionally Andy would crouch down, Ant standing awkwardly by his side. Rhiannon walked silently, also in front, and Christine watched a butterfly land on her shoulder. It was bright yellow with small dark spots on its wings. It was a Eurema smilax or small grass yellow butterfly. Quite common, but something Christine had never noticed in the city. She watched it cling onto Rhiannon’s white cotton shirt with its tiny sticky feet, a slight breeze making its wings move ever so gently. Christine focused on the butterfly to calm her mind. She became transfixed, wondering in her foggy drug-induced mind, if it was a sign from Annabelle. Annabelle loved yellow. The butterfly was yellow. She was trying to tell her something. A strong gust of wind dislodged the butterfly and Christine watched with panic as it flew away. She raced after it, convinced it would lead them to Annabelle. Nobody noticed at first, until Andy called Rhiannon over to show him something and Ant looked back to see Christine running in the opposite direction. ‘Hey, Christine! Where you going?’ Ant called. Christine didn’t answer, it was taking all her energy to not lose sight of the butterfly which was leading her deeper and deeper into the bush. She pushed through shrubs, she was off the path now, panting heavily from the exertion. She rolled her ankle as she scrambled through the dense undergrowth and pain shot up her leg, but she kept running. Rhiannon and Andy started jogging after Ant, while Christine dashed and darted after the speeding yellow butterfly, pushing through branches and around trees. ‘Show me Annabelle, show me where you are,’ she whispered hoarsely. Finally the butterfly stopped. It settled on the flower of a Christmas Bush, its yellow standing out strongly against the white. Christine hunched over, trying to catch her breath. Rhiannon arrived next; a few minutes later Andy crashed through the forest. Her eyes remained firmly fixed on the butterfly. They all peered amongst the mass of flowers on the bush, eventually making out the tiny yellow shape. ‘Yes,’ they said in unison. Ant stepped in close and wrapped his arms around her. Andy walked away first, then Rhiannon. Ant stayed and hugged Christine tightly. Through her tears, she stared at the tiny yellow butterfly, before it lifted gracefully off its flower and disappeared deep into the forest, never to be seen again. It’s the first time I’ve ridden this track on my own; it’s always made me feel slightly uneasy but with a riding companion, there’s nothing to worry about. Right? Right. I duck to avoid a low hanging branch then quickly swerve to avoid a large stick hidden underneath the thick mat of crunchy leaves. I’m getting deeper and deeper into the bush and start to feel disoriented as I come to a fork in the track and wonder if I should go left or right. It’s a common theme in my book; my runaway teens including Annabelle Brown and Keely Johnson never know whether to turn left or right, and more often than not, take the wrong track. I stick left. I nearly fall off my bike when something hits the back of my helmet at full force. I’m terrified. The track narrows and the bush closes in around me. I hear a buzz over the loud crunching my wheels make. It gets louder and louder, then something hits my helmet again, and again. I scream, and get off my bike, flailing my arms about, fighting with the giant buzzing creature that is swarming around my head. I can’t get away from it. I jump back on my bike and pedal as fast as I can to escape, but it keeps up with me. It won’t leave me alone. My legs are burning and I can hardly breathe. I feel it land on my back and I writhe and wriggle to free myself from its dangerous grip. There is no sun in here, and I am completely spooked. I keep pedalling, searching for the light at the end of the tunnel. I know it can’t be far away. Something catches my eye on the ground, tangled in the leaves and undergrowth. It’s a black jumper. My imagination is going wild. What is the jumper doing here? Who does it belong to? I’m not sure if I’ll ever escape the ‘the spooky forest’, and it becomes a recurring theme in all my books. It’s where terrible things happen, deep in the Australian bush. teph’s daughter Sara, Annabelle’s best friend, was home for a school friend’s engagement party, so first stop was her room. Something in her Mum’s tone scared Sara. ‘Don’t tell me,’ she said, snapping her book shut and getting off the bed to move closer. ‘ Annabelle,’ Sara said quietly. Sara tried not to go into a panic. They’d been here before. Waiting, watching, wondering. Watching every news bulletin for that glimpse of information that might connect bones to Annabelle. Daring the phone to ring, wondering how long it would take for detectives Andy Cassettari and Rhiannon McVee, and the seemingly slow-turning wheels of the police system, to match bones in the forest with Annabelle’ s.
Within half an hour Lee and Steph were on the couch, Sara in the kitchen making tea and preparing a platter of sweet treats. ‘Should I call Rhiannon and ask?’ Lee posed this question every time. She and Steph went around in circles, like they had many times before, and eventually talked themselves out of it. Sara handed them their steaming cups of tea, slipping easily into her role of chief carer. She never contributed much to the conversation, letting their words wash over her while she did everything she could to cheer up Lee and look after her every need. Sara kept her thoughts for her diary, the one she was planning to give Annabelle when she came home. Sara stubbornly refused to entertain the possibility these bones could be Annabelle’s. She refused to let conversations like these filter through to her inner belief that Annabelle was still alive and well. That didn’t mean she didn’t feel paralysed right now. With so many bones being discovered, and all this talk of a serial killer on the loose, her hope of seeing her best friend again was at risk of shattering, piece by tiny piece.